So our holiday is over. Well and truly. Although we are still in Greece, sitting in the airport waiting out a two hour and rising delay. Of course we had to be here two hours before the scheduled time to clear the security checks etc. which took about 5 minutes. And so we are here for at least 4 hours. Plenty of time to write a little rant. Apparently we are flying back with a carrier called Titan Air. I have never heard of them. According to the British Airways hastily printed hand out at check in they are renowned for their quality of service. Hmmm we shall see. The hand out also suggested that if they hadn’t leased this Titan aircraft the whole flight would have been cancelled. So I guess the lesser of two evils. Although another night in my luxury hotel wouldn’t have been the end of the world. If they weren’t fully booked. Flying really is the most unreliable form of transport. I find it infuriating. There seems to be so much that can go wrong. This is by no way our worst delay. And by no way the worst incident I have heard of. Last October when we flew to the States we were taxi-ing down the runway. I was gripping tightly to the armrests mentally preparing for the hell that is take off when we stopped. Apparently a warning light had come on. I guess it isn’t a good idea to ignore them, like I do with my car, before a 9 hour flight across the Atlantic. So of course it had to be investigated. It took three hours for that light to be extinguished. A part had to be shuttled in from Vrigin’s parts store to be replaced. By which time my offspring had exhausted their film and video game capacity. The next nine hours of actual flying were tortuous rounds of rummy and toilet trips. Although that was preferable to having to stay behind for a day and miss my first breakfast with Donald Duck. On the way back from Kos we got stuck on the runway. Again. With no electrics. This time they had a broken seat and a full plane. And were therefore one seat short. Increasingly desperate tannoy announcements asked for flight trained individuals who could sit in the spare cabin crew seat (presumably they would not have been expected to serve nuts or explain life vests) and finally for people willing to stay behind. I am not sure of the outcome but we eventually left. And the air conditioning started up again and saved us from the heat that had built up in the large tin can sitting on a runway in 40 degree heat. I have more but would hate to bore you. I think my worst delay was 8 hours. At least this was in an airport. 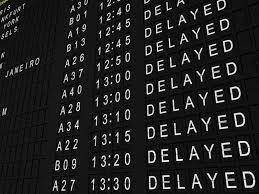 Nearly all my delays have been on the return leg (except for that Virgin Atlantic experience) of our holidays. It is safe to say that British airports are considerably more fun to spend time in than some overseas. The one I spent eight hours in was literally a hut. I think it was a Canary or a Balearic. I can’t remember. Luckily it was BC. Spending time being delayed alone or with one’s spouse is bearable, doing it with three fractious kids is a million times worse. Anyway we are down to 2 hours to wait. I have written this entry over a 2 hour period which has also included loo trips, knock out whist and refreshment foraging outings. I am now being pressed to play Strip Jack Naked, perhaps the most infuriating card game of all time, so I will end. Apparently the kids ‘have nothing to do’ Despite the free wifi. And kindles. And each other. I am evidently a necessary distraction. So off I go to fulfil my primary role. Pray we all get home. Thanks. Oh dear God, what have we done ?………….